Dragon Ball Super Episode 126 Review: Surpass Even a God! Vegeta’s Life-Risking Blow!! Goku and Vegeta!! – Android 17 and Frieza are still hanging in there but Toppo decides to fight Vegeta in order to eliminate one of Universe 7's top powerhouse. Can the Prince surpass a God of Destruction? 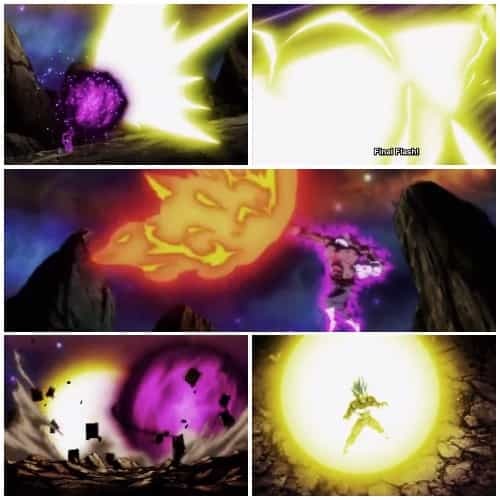 Dragon Ball Super Episode 126 Spoilers Below!!! The animation of Dragon Ball Super episode 126 was somewhat clunky at times. But after the break they were delivering some solid animation and art. We do notice some bad moments early on but they are easily forgettable. 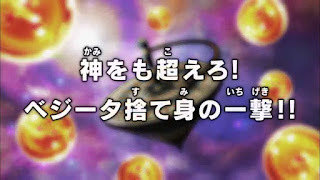 Dragon Ball Super episode 126 started out weak. But as soon as Toppo vs Vegeta started everything was balanced out. This episode relied less on the actual and more on the story of Vegeta and Toppo. One had to leave everything he held close in order to protect his Universe while the other had to protect what he loved and cherished in order to win. That in my opinion was a better route than just fighting. 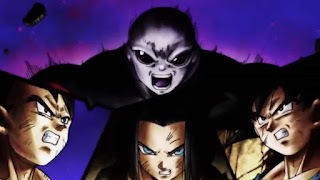 The episode begins with Android 17 and Toppo clashing in a Beam struggle. 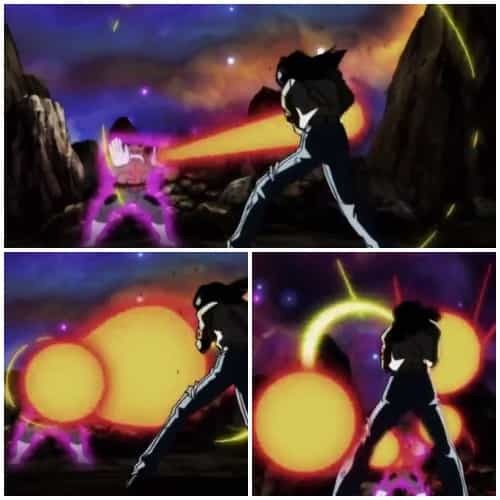 Android 17 is no match for Toppo's Hakai. He decides to out smart the Pride Trooper by luring him in a trap, However this doesn't work. 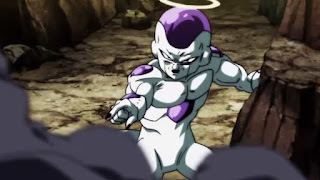 Toppo decides to fire a powerful energy ball on Android 17 to eliminate him, But Frieza shows up and destroys it making Toppo furious. Toppo is trapped in an energy ball by Frieza and starts using his telekinesis to throw rubble at him but Toppo isn't amused. Jiren fighting Goku and Vegeta interrupt their fight. 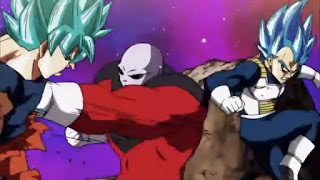 Jiren throws an energy blast which Goku and Vegeta dodge. However 17 and Frieza get caught in it. Everyone is worried that they may be down for the count as they took it head on. Jiren and Toppo come to a fast agreement that Toppo should fight Vegeta. Vegeta is just about to attack Jiren when Toppo attacks him and declares himself his opponent. Toppo starts attacking Vegeta with Ki blasts and Vegeta can't do anything. Over on the side stands everyone notices that Goku and Vegeta are being separated. Shin says that Not only Jiren's but Toppo's momentum needs to be stopped. Vegeta brilliantly sidesteps and Jumps to a cliff. He then powers up and Launches a "Final Flash" on Toppo. Who then answers with a Hakai Ball. Vegeta in confident that Toppo can't beat him with the power of Destruction. 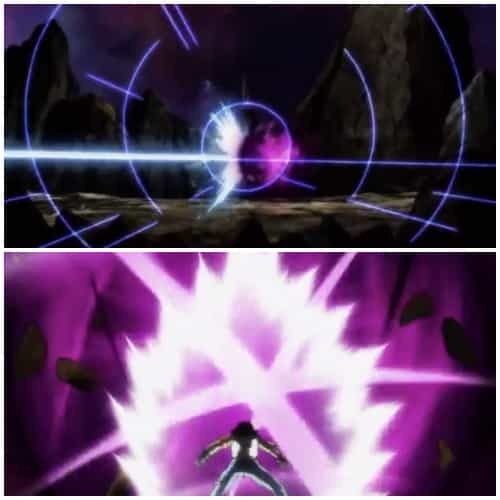 Toppo however overpowers the Final Flash and Vegeta barely dodges the Hakai. Toppo boasts that Vegeta even in his new form and with his new power is no match for him, He say to Vegeta that "He can't beat him. He never will". Vegeta says that he needs the Super Dragon Balls to keep his promise to Cabba and He can't lose here. Toppo then blitzes him and starts to beat Vegeta. Toppo's new power leaves Vegeta in awe. The Pride Trooper sends The Saiyan back with a good blast to the nearby Cliff. Toppo berates Vegeta and laughs at the thought of "Promise Among Saiyans". Toppo then Charges a giant Energy Ball and hurls it towards Vegeta. 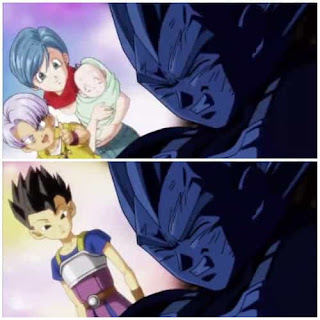 Vegeta decides that he will not leave his family, His promise to Cabba and His Pride as a Saiyan. Powers up and attacks Toppo. Belmod in shock orders Toppo to destroy everything. Toppo uses Hakai, Vegeta covers his hands with his God Ki to protect himself from the Hakai energy. Vegeta berates Toppo for not protecting his pride. Toppo tries spamming Hakai while Vegeta attacks him. Vegeta resolves to use an attack too powerful for Toppo to destroy. He starts charging his attack. Piccolo recognizes this and we get a flashback of "Vegeta's Atonement" from the Buu saga. Toppo launches a massive Hakai Ball but Vegeta's attack proves too much for Toppo to destroy. 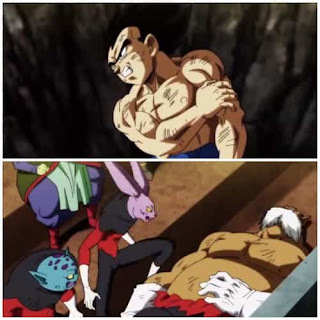 Toppo is eliminated. . Universe 7 think Vegeta sacrificed himself to eliminate Toppo. Vegeta however is alive but out of power. 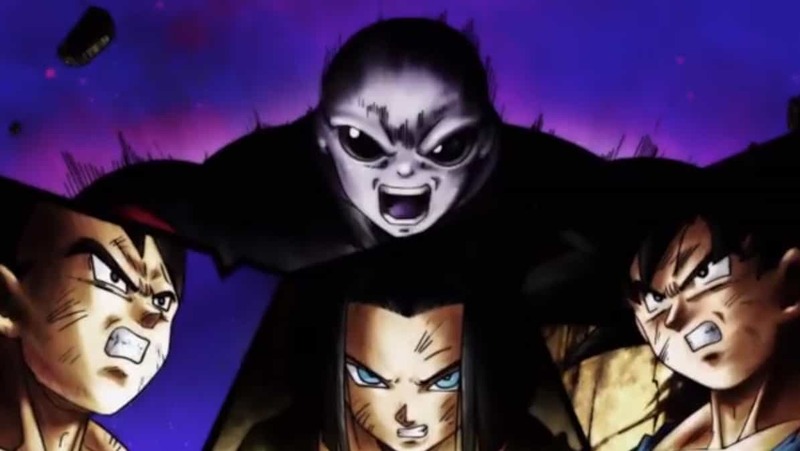 But since he's stronger than the last time he used this attack, he is able to withstand it.Android 17 finally shows up, bruised however. Nonetheless everyone is glad he is still alright and in the fight. Only opponent left is Jiren. Jiren calls Toppo pathetic, Goku asks why before Jiren kicks him in the Gut and Goku is thrown to a Cliff. He praises Vegeta for defeating Toppo without casting anything aside. 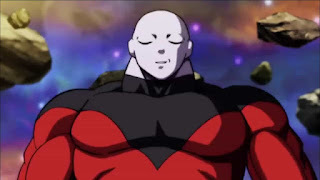 Jiren smiles and finally decides to show his True Power. Tournament of Power ends in 4 minutes. Vegeta after all this time finally getting his Major Victory over a powerful adversary. Vegeta actually showcasing his characters growth. A good flashback and exposition from the Buu saga. A slow start of the episode. I have mixed feeling about Dragon Ball Super episode 126. Last week Toppo was a big deal in Dragon Ball. He was treated poorly this week. Jiren even called him pathetic, which I understand why but still think it was unnecessary. But Vegeta hasn't had any real moment in this arc. So yes, I really enjoyed that aspect of the episode. Also Vegeta finally got a major Victory in his career. His is the first main Character to beat a God Of Destruction. That is saying something. One last thing, Where is Frieza? Episode 127 next week looks really promising.